From where I live, I can view some of the building of Manhattan. 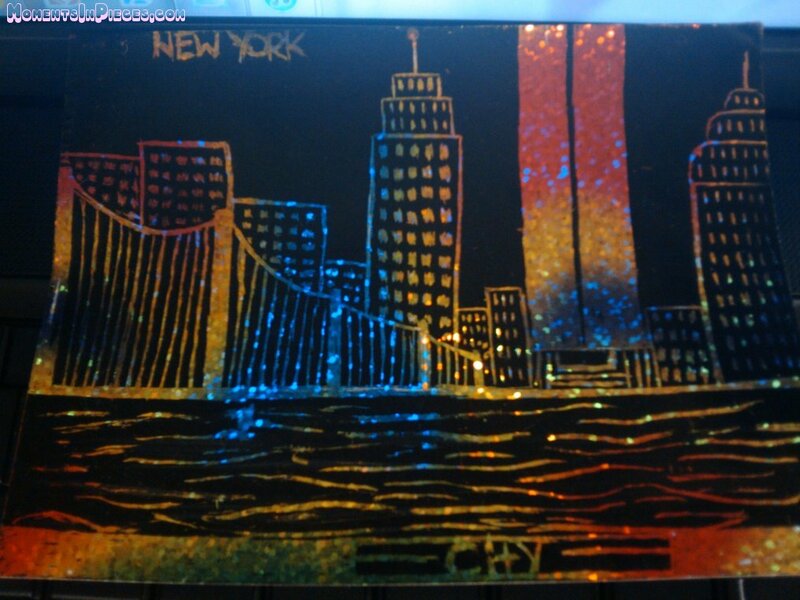 For example the Chrysler Building, The Empire State Building, and The World Trade Center (ten years ago). I was in the third grade. I can’t remember much, but some things I can’t forget about that day. The lunch period just started as I was eating in the cafeteria when all of a sudden the teachers came down to take their classes back up into the classrooms. When my class went back to our room,we saw our teacher on the phone. The announcements came on, but I barely remember. My teacher started crying, and spoke about her brother being in the Twin Towers. A few minutes later, another teacher came in the room and escorted my class down and dismissed us. My mom was already waiting outside to take me home. They let her out of work early as well. When I came home, I ran to look out the window. And it was gone. All that was left was black smoke coming from where the World Trade Center use to stand. I couldn’t believe it. The building I saw just the morning before I left for school, a few hours later, its gone. Though I was too young to understand much, I knew this was not a good thing. I turned on the TV, and all they were showing was two planes crashing into the World Trade Center repeatedly. It was tragic just watching a plane full of people crash into a building for no apparent reason. And watching many as they jumped out of the top floors hoping to make it alive. After that horrid day, many people were victims of racism. Threatened to be killed for being a Muslim. Many were captured, held hostage and questioned for over months, and some even years. They were beaten down, stripped, and tortured. The evidence found against the victims proved to be immoral and was absurd and proved to be nothing at all. The victims were traumatized after being in a prison for so long. Many couldn’t even hold down a proper job. And because of their “criminal” records of being in jail, they could not find a job at all. September 11, 2001, a day that none of us New York-ers can forget. A record number of 2,977 people died, as well as 19 hijackers. More than 6,000 people were injured. Total number of hate crimes reported against Muslims, 1,714. Hate crime that were left unreported, too many to count. Countless things have happened and gone wrong after the terrorist attack on the World Trade Center. R.I.P. to those who became victims of this tragedy. 9/11, we will never forget the lives that were lost. This entry was posted on Monday, September 12th, 2011 at 12:33 am	and is filed under Pictures, Rant. You can follow any responses to this entry through the RSS 2.0 feed. You can leave a response, or trackback from your own site.